Robinson Labs absorptive modulator. 1.0 - 2.0 GHz. "SMA" female connectors.SMC bias control. 2.05" x 1.54" x 0.785". New!! Alt. P/N: Litton 40-010769-07. 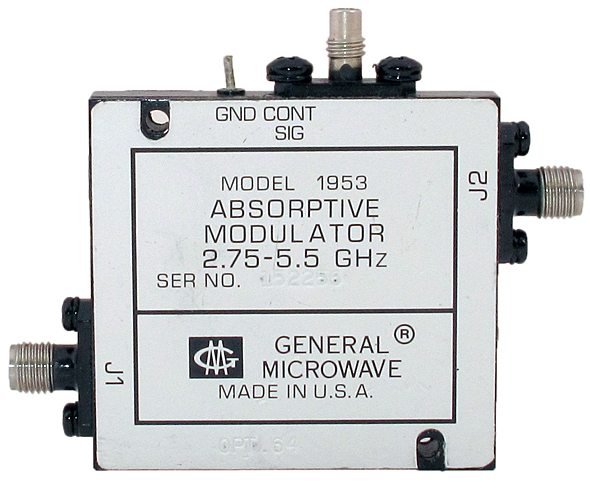 General Microwave absorptive modulator. 1.0 - 2.0 GHz. "SMA" female connectors. 1.806" x 2.385" x 0.115". 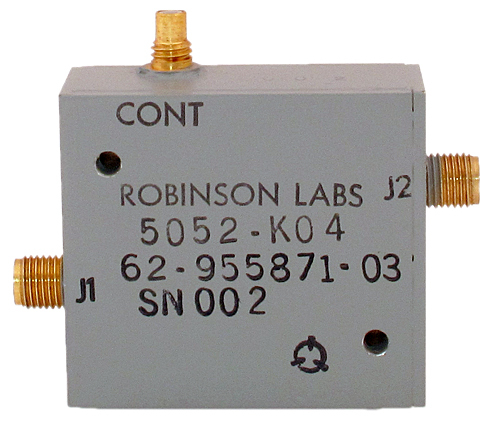 Robinson Labs absorptive modulator attenuator. 2.0 - 4.0 GHz. "SMA" female connectors.SMC bias control. 20 nS switch speed. 2.6" x 1.7" x 0.628". New!! Robinson Labs absorptive modulator attenuator same as above except used. Excellent condition. 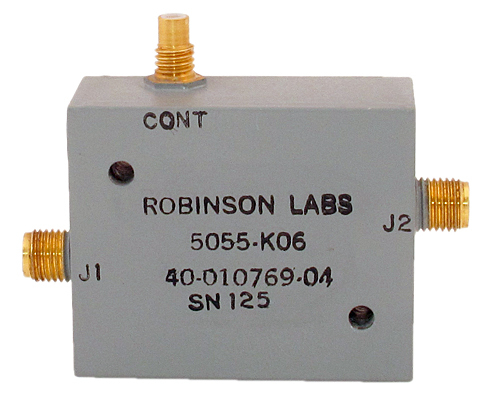 Robinson Labs absorptive modulator attenuator. 2.75 - 5.5 GHz. "SMA" female connectors.SMC bias control. 100 mW power out. 1.413" x 1.573" x 0.621". 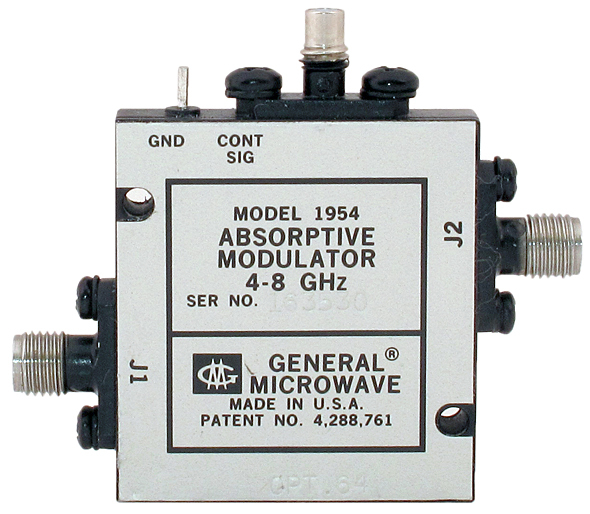 General Microwave absorptive modulator. 2.75 - 5.5 GHz. "SMA" female connectors. SMC bias control. Opt. 64. 1.6" x 1.48" x 0.111". General Microwave pin diode attenuator with hybridized driver. 2.75 - 5.5 GHz, 0 - 60 dB. "SMA" female connectors. 1.501" x 1.602" x 0.322". New!! Only one available. 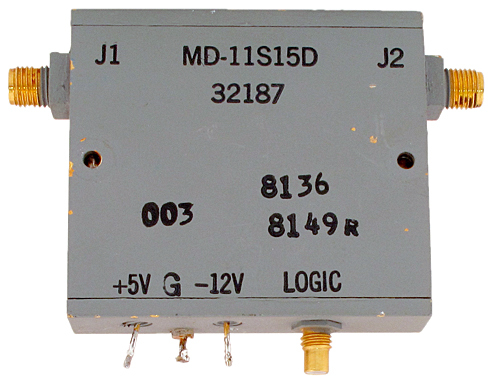 General Microwave pin diode attenuator with hybridized driver same as above except used. Excellent condition. 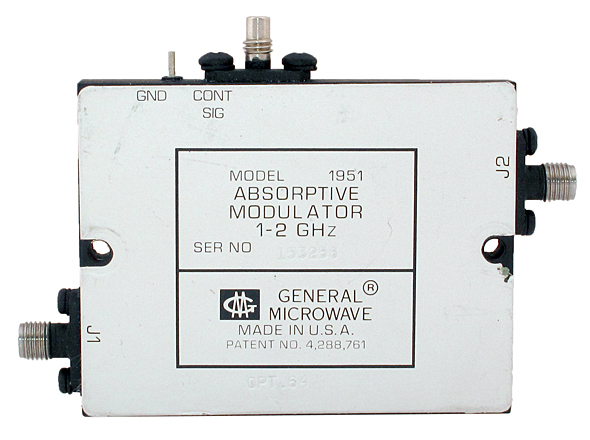 General Microwave RF attenuator with hybrid driver. ±12 vdc. 4 - 8 GHz. "SMA" female connectors. Opt. 120A. SMC bias connector. 1.204" x 1.105" x 0.326". 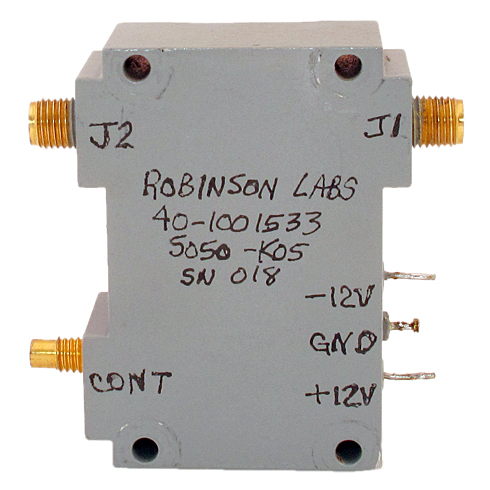 Robinson Labs absorptive modulator attenuator. 4.0 - 8.0 GHz. "SMA" female connectors.SMC bias control. 100 mW power out. 1.406" x 1.587" x 0.621". New!! 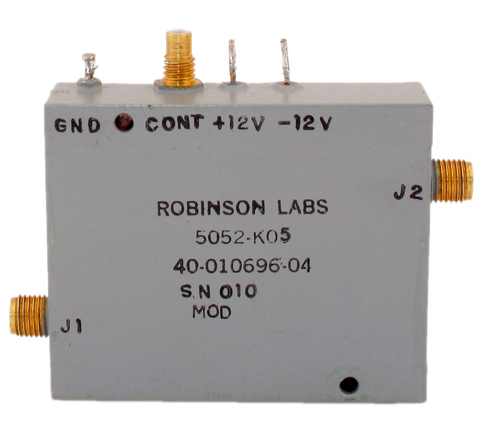 Robinson Labs absorptive modulator attenuator same as above except. used. 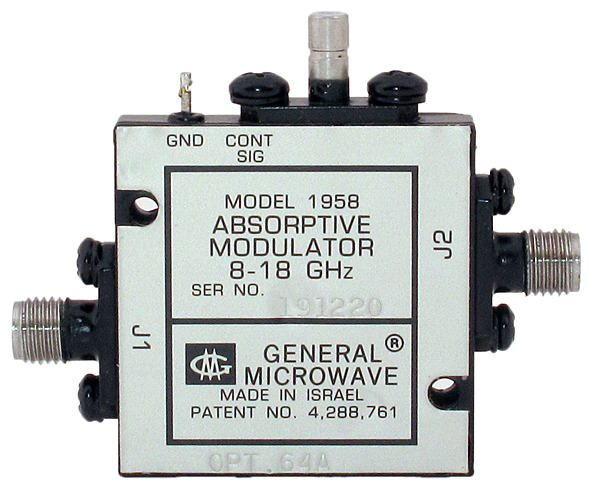 General Microwave absorptive modulator / attenuator. Current controlled. 4 - 8 GHz, 0 - 60 dB. "SMA" female connectors in / out. SMC bias control. Opt. 64. 1.199" x 1.110" x 0.117". General Microwave pin diode attenuator. Current controlled. 8 - 18 GHz. "SMA" female connectors. SMB bias control. 1.06" x 1.06" x 0.124". Used. 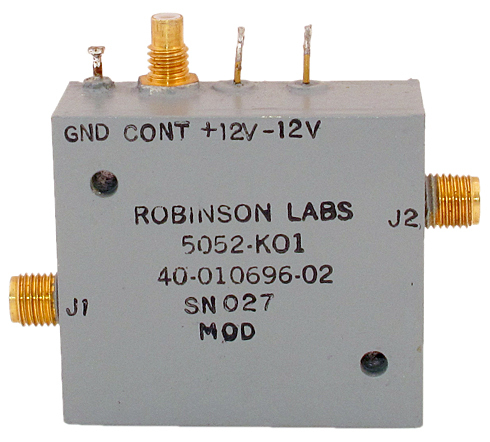 Robinson Labs absorptive modulator attenuator. 8 - 18 GHz. "SMA" female connectors. SMC control. 100 mW power out. 1.251" x 1.511" x 0.621". New!! Alt. P/N: Litton 40-010769-04. 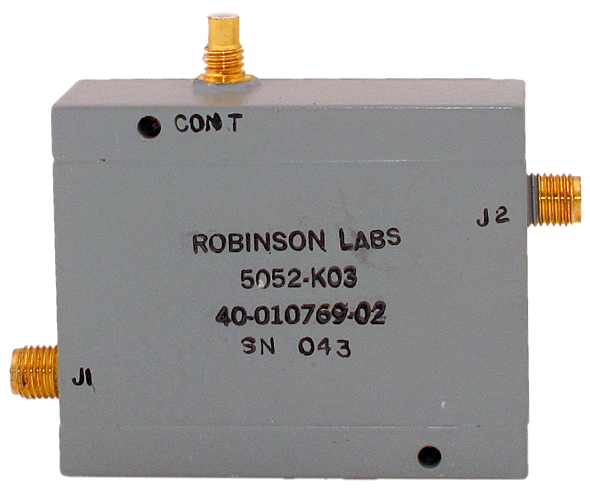 Robinson Labs absorptive modulator attenuator. "SMA" female connectors. SMC bias control. ±12 vdc. 2.6" x 1.7" x 0.628". New!! Alt. P/N: Litton 40-010696-01. 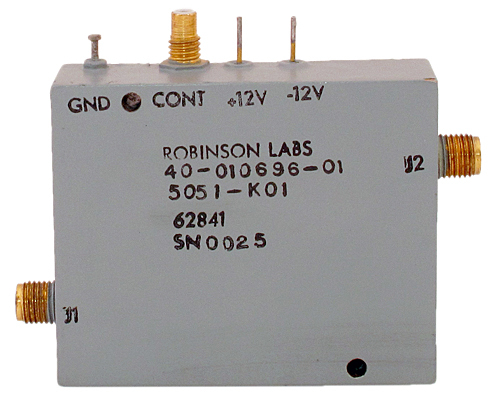 Robinson Labs absorptive modulator attenuator. "SMA" female connectors. SMC bias control. ±12 vdc. 1.51" x 2.009" x 0.756". Used. Alt. P/N: 40-1001533. 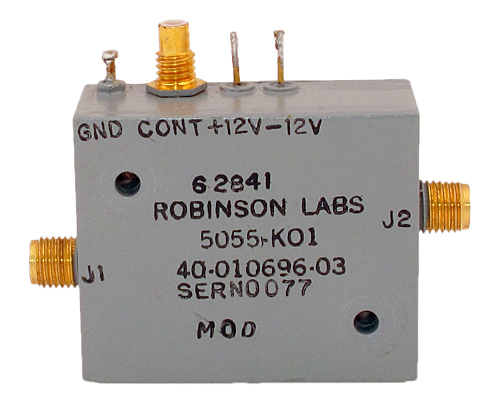 Robinson Labs absorptive modulator attenuator. "SMA" female connectors. SMC bias control. ±12 vdc. 1.413" x 1.573" x 0.621". Used. Alt. P/N: Litton 40-010696-02. 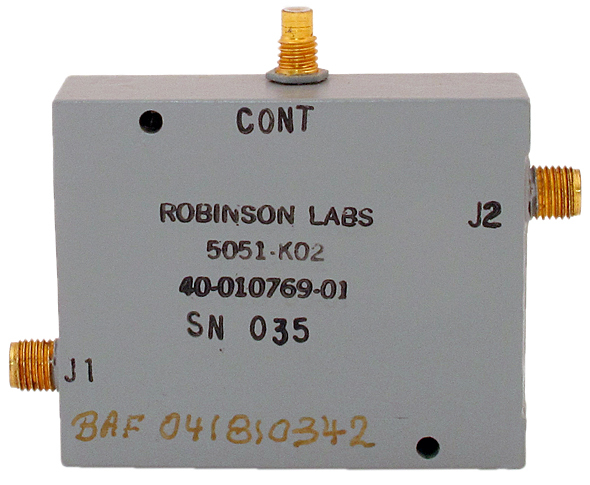 Robinson Labs absorptive modulator attenuator. "SMA" female connectors. SMC bias control. ±12 vdc. 2.073" x 1.708" x 0.621". Used. Alt. P/N: Litton 40-010696-04. 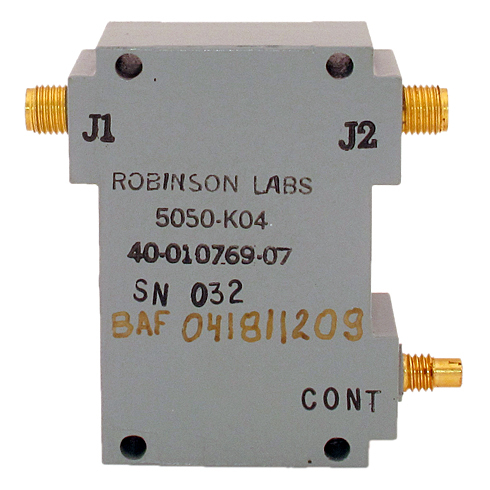 Robinson Labs absorptive modulator attenuator. "SMA" female connectors. SMC bias control. ±12 vdc. 1.26" x 1.515" x 0.621". Used. Alt. P/N: Litton 40-010696-03. Micro Dynamics absorptive modulator attenuator. "SMA" female connectors. SMC bias control. +5v / -12v / TTL. 1.598" x 1.798" x 0.306". Used. 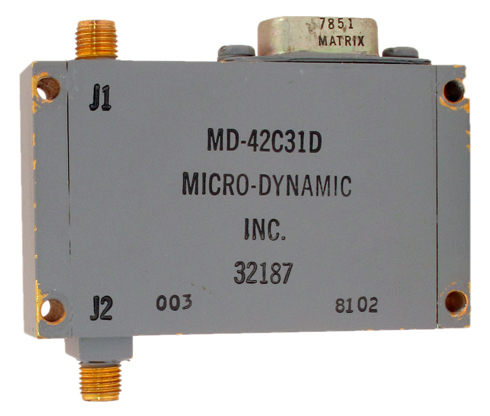 Micro Dynamics absorptive modulator attenuator. "SMA" female connectors. DB9 control. 2.3" x 1.3" x 0.42". Used.